Founded in 2013, BitGive is the first Bitcoin 501(c)(3) nonprofit, giving it tax exemption status at the federal level in the United States. 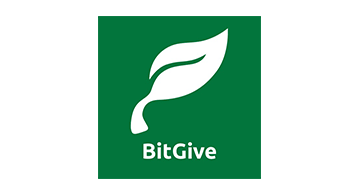 BitGive has built a positive philanthropic representative organization for the Bitcoin and Blockchain industry, bridging the gap between an innovative technology and its practical applications for nonprofits and humanitarian work in the developing world. BitGive has established strong partnerships and raised funds with well-known nonprofits including Save the Children, The Water Project, TECHO, Medic Mobile, and more. In 2015, BitGive announced its Bitcoin Charity 2.0 Initiative, which includes a variety of projects aimed at leveraging Bitcoin and Blockchain technology to benefit charitable organizations worldwide. Their flagship project is GiveTrack, a revolutionary donation platform for nonprofits to provide transparency and accountability to donors by sharing financial information and direct project results in real time. BitGive has been featured in Forbes, Entrepreneur, Wall Street Journal, US News and World Report, Non Profit Times, Inside Philanthropy, Chronicle of Philanthropy, and more. Ms. Gallippi, BitGive’s Founder and Executive Director, has presented internationally on the social impact of Bitcoin and Blockchain.